More than 100 scientific studies have been carried out using Pharma Nord’s two Q10 preparations, Myoqinon and Bio-Quinone CoQ10. 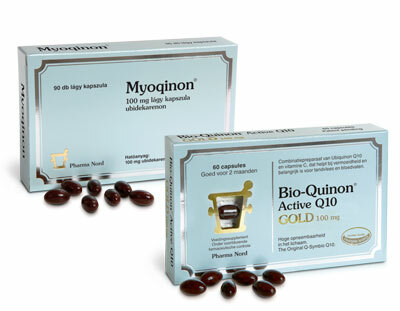 Myoqinon contains 100 mg of coenzyme Q10 dissolved in vegetable oil and is registered as a medical drug in certain EU countries. The product has been used in numerous studies, including in the groundbreaking Q-Symbio study that is published in the Journal of the American College of Cardiology. Bio-Quinone CoQ10 is Pharma Nord’s dietary supplement version and contains 100 mg of coenzyme Q10 dissolved in vegetable oil. Although it is a dietary supplement, it is manufactured in the exact same way as the medical drug version in terms of materials and quality and safety inspection rules. Bio-Quinone CoQ10 contains the same Q10/oil formula as Myoqinon and was used in the KiSel-10 study that was published in the International Journal of Cardiology. CoQ10’s impact on the heart was clearly demonstrated by Danish scientists who decided to test the substance on patients with chronic heart failure. Normally, a large number of patients die within a five-year period after being diagnosed with heart failure but things worked out differently in the Q-Symbio study, which was published in 2014 in the Journal of the American College of Cardiology, Heart Failure. 420 patients with chronic heart failure were randomly assigned to either 3 x 100 mg of high-quality coenzyme Q10 or identical “dummy capsules” as add-on therapy to their conventional heart drugs. The outcome made jaws drop! In the CoQ10 group, there were 43% fewer heart-related deaths. In addition, the weakened hearts suddenly had more power and strength to pump compared with the hearts of patients in the placebo group. The improvements were attributable to the CoQ10 capsules alone, and cardiologists across the globe could hardly believe their eyes and ears when the study was published. Heart disease is one of many diseases associated with reduced CoQ10 levels in cells. However, as a natural part of the ageing process our CoQ10 levels drop so everyone experiences decreasing heart power. With CoQ10 supplements, we have a natural way of dealing with that problem and, as the Q-Symbio study showed, we can even apply that strategy to people with heart ailments. Healthy people, however, can also benefit from CoQ10. This was demonstrated in the KiSel-10 study, which was conducted by Swedish researchers. In this study of 443 healthy men and women aged 70-88 years, daily supplementation with 200 mg of coenzyme Q10 in combination with 200 micrograms of selenium reduced cardiovascular mortality by 53%. Furthermore, the people in the treatment group had substantially stronger heart muscles, and in a follow-up analysis of the data the scientists concluded that people who had been given coenzyme Q10 and selenium had significantly better quality of life and were much more vigorous, compared with those who had been given placebo preparations. The CoQ10 supplement that was used in the Q-Symbio and KiSel-10 trials was manufactured using a unique technique that ensures complete absorption of the active ingredient in the body. With more than 100 published studies to document its bio-availability, quality, and safety, this supplement is the best documented brand on the market and the preferred choice among researchers, who conduct studies with CoQ10. In fact, this specific CoQ10 supplement has been selected as the official science reference (gold standard) of the International Coenzyme Q10 Association (ICQA), which is the organization that coordinates all CoQ10 research internationally. Pharma Nord's research department is always at the forefront of the latest international nutrition science. Scientific studies and articles are carefully registered and catalogued in the most comprehensive research database of the industry, currently holding more than 9,000 scientific references. A considerably amount of these studies has been conducted using Pharma Nord's own products. The research database is continuously revised whenever new studies of relevance to Pharma Nord's products are published. The research department's library is a vital tool for developing new products and improving existing ones. Besides the many scientific articles and studies used by Pharma Nord as a foundation for developing new products and improving or updating those that already exist, the company has conducted over 300 published studies with products of its own. This research is the cornerstone of the entire documentation that is so vital for the success of Pharma Nord's products. New titles are continuously added to database. Pharma Nord actively supports science in its efforts to find new treatments, in particular in order to increase the quality of life of people who, due to age or illness, can benefit from the medicine Bio-Quinone for prevention and treatment of coenzyme Q10 deficiency. Among other things, Pharma Nord's preparations were used in the Swedish KiSel-10 trial with Q10 and selenium supplements for healthy elderly and also Q-Symbio, a large, multinational trial using Q10 from Pharma Nord. Both trials were completed with exceptional results. The fight against cancer is one of medical science's greatest challenges. Pharma Nord is actively involved in international research in cancer prevention and treatment. One of the largest and most ambitious planned European research projects in this area to date is the international PRECISE study. Pharma Nord delivered both tablets and placebo tablets for the PRECISE pilot study. The PRECISE study that were planned to encompass 35-40000 volunteers from Denmark, Sweden and England, is not yet funded. Pharma Nord has also supplied preparations for a large multicenter study of bladder cancer with patients from centers in Belgium, France and England. Because of its good and well documented bio-availability Pharma Nord's coenzyme Q10 preparation is a reference product for the International Coenzyme Q10 Association and has been tested in more than 70 studies. This research is one of the main reasons why the preparation is able to document such a high level of bio-availability. What is more, the fact that it has been on the market for close to 20 years provides good safety data for the product. In some areas the amount of new science surfaces so frequently, it pays off to arrange regular symposiums, where scientists from all over the world gather to present the latest scientific breakthroughs. In many cases, Pharma Nord hosts or co-hosts such events. So far, scientific symposiums and conferences have been arranged in research areas like Q10, CLA and selenium. Consumers make their own experience and this is of invaluable importance to our existing and future products. Although consumer experience can hardly be classified as "scientific documentation" it still gives a clue as to whether or no the preparations have an effect and are generally safe to use, short- or long-term. For this reason, Pharma Nord regards every type of consumer feedback as something of enormous value, and actively encourages consumers to contact the company if there is a story to tell.